Because your child's room should be as awesome as they are. What Pausch understood, and what kids innately know, is that children need space that’s theirs, where they can let loose and really be creative. One of the first mistakes parents make when creating a space for their kids is not involving them in the process enough. The best way to set out on a project like this is making your kids a part of it from the beginning. And giving up a little control can make all the difference in how well-loved the room becomes. “What really makes a difference is when parents allow their kids to conceptualize, and pick the colors and textures, and have a say in what elements they would like in the space,” says Doug Masters, founder of the design and building firm Masters Touch in Medfield, MA. 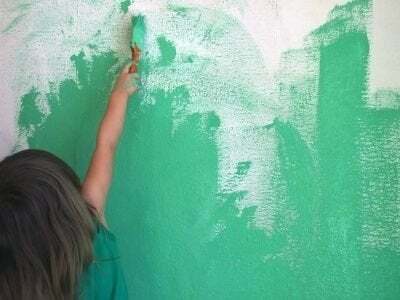 Paint can be a very evocative substance for kids, who are often passionate about the colors they love and those they can’t stand. Kelly J. Thyen, owner of the Blaine, MN-based kids’ design boutique Wiggles N’ Giggles, says parents should consider not only their child’s interests, however, but also the “psychology of color” in choosing the base shade for their child’s creative area. “Blue is a fabulous color for a kids’ space,” she says. “It is a peaceful color that actually causes the human body to create calming chemicals and also make you more productive. Green is another great color because of its calming effect.” Thyen adds that although kids often love colors like red and yellow, using them only as accent colors may make for a more pleasant space. “Red stimulates chemicals in your body that create excitement and hunger, and yellow can have a very unsettling effect; even though it’s cheerful and sunny, it tends to make people loose their tempers and children cry, which is definitely not what you want in your child’s play space,” she says. When designer Sharon McCormick, principal of the Durham, CT-based Sharon McCormick Design, LLC, created a playroom for her clients with a rambunctious two-year-old, she knew she had to choose materials that were both attractive and durable. McCormick also chose beadboard wainscoting for the room. “It’s tough and much more washable than sheetrock,” she says, adding it’s important to choose high-grade paint that can withstand multiple cleanings before having to be repainted. But even then, having the wainscoting will reduce your work. “Since with little kids, the lower half of a wall takes the brunt of the dings, when it’s time to repaint, you can just repaint the wainscoting instead of the whole room,” she says. For fabrics, she chose stain-guarded, relatively inexpensive cottons and rugged denim. And instead of choosing fragile tassels for window treatments, she went with a more practical trim. “We used a braid trim on the bottom of the roman shade and saved the tempting tassel fringe for the top of the valance,” she says. Creating a room that’s just for kids means they will sometimes end up there without much adult supervision, which is why safety is a key concern in any room you design with kids in mind. Still worried about the resale value of your house if you install that fireman’s pole your son craves or turn your fourth bedroom into a jungle room? So was Janie Glover, who created a deluxe playroom for her daughter Katherine in their former home in High Point, NC. When the family put the house up for sale, their realtor suggested they remove the room, which had been featured in several local papers and had been a labor of love for the entire family. So Glover decided to wait.